Starting your business is a like a whole other job. Which would be fine except you already have a full-time job. How are you supposed to find the time to write your business plan or validate your business idea when you’re already working 40+ hours a week? Friend, today you’ll learn the powerful mindset and strategy you can use to to create the time to start your new business…working full-time. I even have a guide for you to set your own schedule to balance your j.o.b. with your brand new business. We all know running a business takes a lot of time. But so does starting a business. How in the world do you find the time to start your business when you’re working 40+ hours a week? Today, I’m sharing a philosophy and strategies to help you create the time you need to start your own business. When I first decided to start my own business, I was working full-time as a data analyst. I was volunteering my church and with my college alumnae club. And I quickly felt like I had no time to do any of the things I needed to do. Until I made a shift in my mindset and, as a consequence, my behavior. So today, I’m sharing a new perspective and strategies that you can use to create the time you need to start your business. First, I have to talk about mindset. Also known as the fuel (or the kryptonite) to any strategy or behavior. More than anything, the strategies I’m sharing are born of two core beliefs. The beliefs are that (1) how I am spending my time is worth it and that (2) I have enough time to invest on the things that truly matter to me. Even if you listened to the strategies, but you did not truly believe that spending your time on starting your business was worth the effort OR that you actually had enough time, you would be right back in the same position you are in. Just with a few new tricks that you’re not actually going to use. So we have to begin with the mindset. First, you have to believe that starting your business is worth your time. When I decided I was going to start my own business, I truly believed that spending a Saturday morning researching online marketing strategies and editing my website copy was well worth it. Not just in the long-term, in the sense that I could have a thriving, profitable business that supported my lifestyle. During the beginning that vision feels exciting but sort of like winning the lottery. Sure it could happen, it would be really great if it did. But there’s no tangible evidence that this thing is going to happen. But I knew the time I was spending was worth it in the short-term. I knew that me spending my Saturday morning or a Monday night building the foundations of my business would mean that I could get my name out there. I knew that would mean I would know a little bit more and be a bit more prepared for the next time I sat down to work on another part of my business. When I felt that I was spending my time on something truly meaningful, I was immediately rewarding. I did not have to delay my gratification because while I didn’t have the gratification of a full business yet, I did have the gratification of feeling more prepared, more knowledge, and actually taking steps to create the kind of career I wanted. That’s the first core belief that is vital in order to make time to start your own business. If you really do not feel like what you’re doing is worth doing, it does not matter what strategy you try; you will not keep doing it. Second, you have to believe that you have enough time. The second core belief that is important is believing that you have enough time. I’m sure you’ve heard about people comparing the amount of free time they said they had vs. how much they really had and realized they had a lot of time. Yeah, that’s so hackneyed but it is true. I had a lot more time to spend on the things that mattered than I was telling myself. I had to take a good hard look at what truly mattered to me. I knew spending time with my husband was a non-negotiable. I knew my full-time job was a priority so I couldn’t cut out the 40 hours a week I was spending while I was there. I knew my health and working out was a priority. But I did know that there were things I had to say no to. Like cutting back on volunteering, book club, binge watching Real Housewives. No, it did not feel 100% pleasurable, but I also felt that it was a worthy sacrifice. Third, you have to work through your resistance. Having to layout my priorities forced me to take a hard look at the beliefs and protective habits that may have served me in the past, but were conflicting with what I wanted right now. Essentially, all the beliefs that I was resistant to letting go of had to be on the chopping block as well. My friend’s question put me on the spot in the best way. It wasn’t simply about doing my job well for myself or for my employer. Her question forced me to look at how trying to be “good” for other people was going to keep me stuck. In the case of my full-time job, I had this deep sense of worth that depended on seeing myself as “good” employee. This stemmed from years of building an identity around being a “good” student, a “good” daughter. Never get in trouble, never disappoint anyone. While being “good” looked like a healthy value, it was really a protective mechanism for never feeling the sting of being judged, being excluded, or being punished. When I saw that this was what was happening, I had to lovingly let go of that belief and grow up. I could no longer maintain an identity around being “good” in this way if it meant I would seriously stop myself from creating the time I needed to start my own business. I chose to take that hour back every weekday morning. Which meant I just “found” 5 extra hours a week to work on my business. There will be some serious resistance to using the time that you do have to work on your own business. This is where the real work is. The resistance to saying no to family or to being unavailable for your friends. You have to have to ask yourself, why is that such a hard thing for me to do. And you have to honestly ask yourself, are these habits and mindsets I want to maintain? Are the helping you? If not, you’ve got to let them go. Even if letting go is painful. Now that I’ve talked about the inner work of creating the time you need to start your own business, let me talk about the outer work. The outer work is all about routines. Ya’ll, I love me a good routine. It’s so much fun. And here’s why I’m adamant about you making a routine that works for you as you’re starting your own business. Routines are habits in motion. Which habits do you want to put in motion? When you get into your car to drive, you (I hope) put on your seatbelt, turn on your music or the Chantiluke podcast (ba-dum-chaaa), check your mirrors, and drive. It’s so helpful to have this routine because you don’t have to think about making a decision on what’s going to keep you safe and entertained. You don’t expend energy on making a decision. You expend energy on driving. That’s the same reason I want you to create a routine to work on your business. Because you get out of expending energy on making a decision on when to work, where and just use your precious energy on your business. When I was working full-time, I knew Saturday mornings 9-12 were my work times. Also Mon-Fri 7:30-8:30am were my work times. That meant 9 hours a week at a minimum to work on my business. No questions. During the weekdays, I worked at my desk in my home office. On the weekends, I kissed my husband goodbye and went to my favorite coffee shop. No thoughts, no decisions about when I worked. Where I worked. Nope. Just get up and go. I didn’t have to look at my schedule and ask myself “Will I be able to squeeze in writing my podcast scripts this week?” I also did not have to feel bad at the end of the week knowing I did not make time for my business. No, I already had the time to do so. When you stop having to guess whether or not you have the time to work on your business, you spend more of your precious energy actually doing the work. You need to protect your business work time, just like you would protect your business working time. You wouldn’t schedule a nail appointment during an important meeting for your full-time job. Why? Because your full-time job is a priority. Well I want you to commit the same dedication to your business and protect that time that you designate as work time for your business. I want to leave you with a few more tips and tricks. Communicate with your loved ones that you’ve got a new priority in your life. I knew that I would be spending Saturday mornings away from my husband. And I had to be clear with him this is important but also demonstrate that while we won’t have Saturday mornings to spend time together, we would have other times that I protected just as fiercely. Use your technology! Set a calendar event that repeats for 1 year with your new schedule and set your reminders. These are important events ya’ll, show up for them. Get an accountability buddy. If you’re just starting out, then enlist the help and support of someone who loves you and will be sure to hold you accountable. I wish I did this more intentionally when I first started my business. I spent a lot of time alone and isolated, and that did not feel that great. But the more I enlisted the support of others, I could keep my head up even when I didn’t feel like it. This is why I created my group coaching program. Motivation Gets You Started, But Dedication Keeps You Going. Expect to be bored. Expect to feel totally pissed off that you’re spending your time starting a business. Not even running it and you’re spending all this time. The thrill and energy of motivation will get you started in your new routine. But it sure as hell won’t keep you going. That’s where dedication comes in. Not dedication to be a perfect person who never misses the scheduled times. No. Instead, dedicate yourself to this entire experience, the frustrations of not wanting to work on your business. The thrill of getting a referral. Just dedicate yourself to being all into your experience. You most definitely can create the time to work on your business. Release the resistance, prioritize what matters, and set your routine. With this mindset and strategies, will you will be on your way to running your thriving business. Get the guide to set your own Business Routine. Episode 36: "I'd Start A Business But...I Don't Know How"
Episode 35: "I'd Start A Business But...My Idea’s Been Done Before"
I’m Danielle! 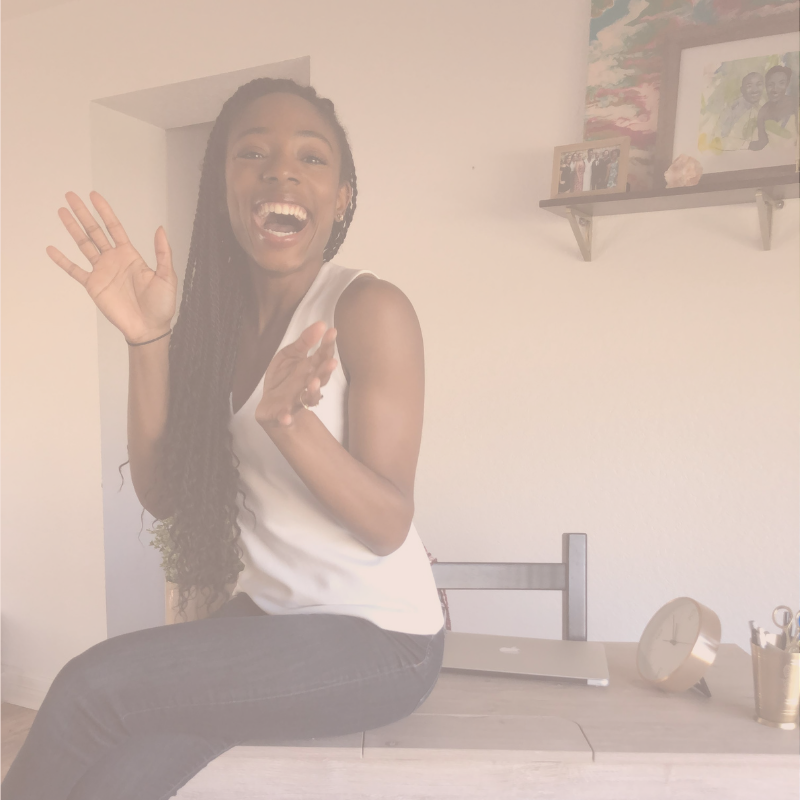 I created Chantiluke (shan-ti-luke) to help creative, multi-passionate women start their own business & do the creative, fulfilling work they were meant to do.